Did you know that including spicy ingredients in our food helps to rise our body temperature? The higher body temperature of course helps us keep warm, and it also helps to burn up calories -- which is a great thing this time of the year. This is a heavily seasoned stew with Middle Eastern elements. The heat mild spicy heat and the aromatic baharat seasoning leaves a tingle on the tongue. It is difficult to explain the delicious and complex flavors -- you'll love it. The addition of seasonal root vegetables make it a great option for lunch or dinner. A medium spicy chicken stew that is inexpensive, easy to prepare, and has minimal cleanup. Serve with rice and warm corn tortillas for a complete and warming winter meal. This recipe has the healthy and authentic flavours of Mexican cuisine. Naomi Imatome-Yun, Korean Food Expert, shares this authentic recipe that "warms you from your lips to your toes." Sounds perfect on a chilly day! In my book there is nothing quite like a bowl of beans to warm me right up. This is one of my favorite recipes that can easily be adjusted with whatever ingredients that you have in your refrigerator. The stew has a mild to medium spicy heat. 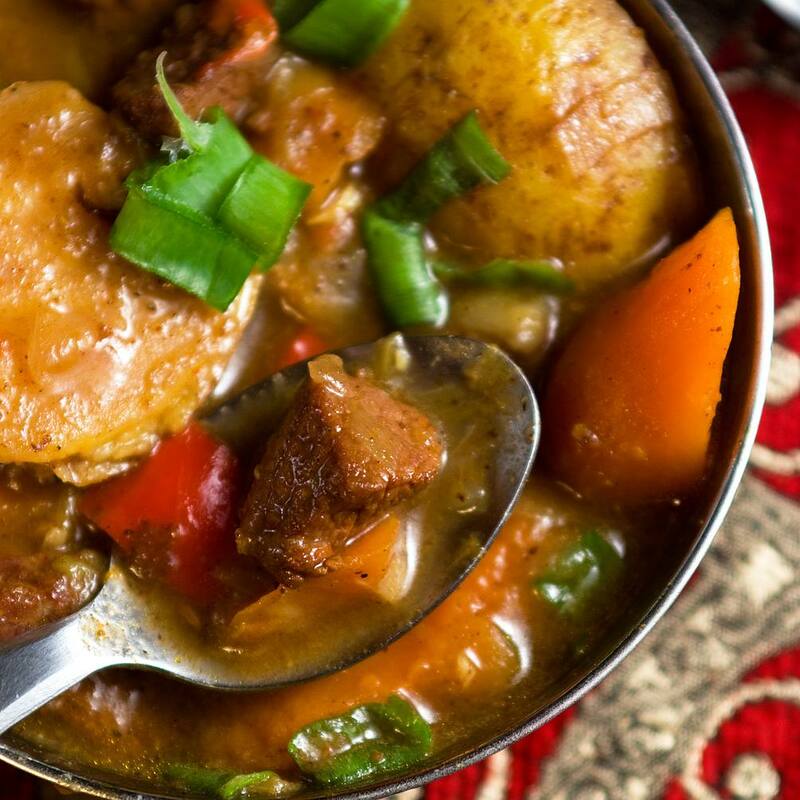 Freda Muyambo, African Cuisine Expert, share her recipe for this aromatic and exotic chicken stew from Ethiopia. The heat is medium spicy. A list of great soup and stew recipes would not be complete without Mexican pozole. The chile based broth is simmered with chicken and topped with fresh radishes, lettuce, salsa and anything else you'd like. It's heat is mild spicy, but you can bump up the heat with additional chiles or toppings. If you love curry and pumpkin you're going to love this stew recipe from Myanmar. The ingredients list is short and so is the preparation time. This is a mild spicy curry. A Japanese classic made in about 15 minutes. The miso udon soup is made spicy by adding as much or little chile flakes as desired. Thai cuisine is among the reigning spicy foods of the world. This delectable seafood soup by Darlene Schmidt, Thai Food Expert, is a must try. The heat is medium spicy. Lentils are a powerhouse of nutrition and very friendly to your wallet. In this mild spicy recipe of spicy green lentils, we've added a couple of vegetables and some chilies to create a healthy meal that neither cost too much or takes too long to prepare. Often thought of as a Mexican recipe, this dish of cayenne spiced chili con carne, is in fact from Tex-Mex cuisine. Regardless, it tastes great with tortillas or warm cornbread. One fantastic thing about this dish is that the spiciness may be adjust to your personal taste. Don't have time to cook soup? Throw the ingredients in a crockpot to create this healthy chicken and vegetable soup by Diana Rattray, Southern Food Expert. If you've never eaten Vietnamese cuisine you are seriously missing out. Pho ga or chicken soup is a great introductory dish into the amazing flavors of Vietnamese cuisine. The soup is mild spicy but can be made as hot as you like. 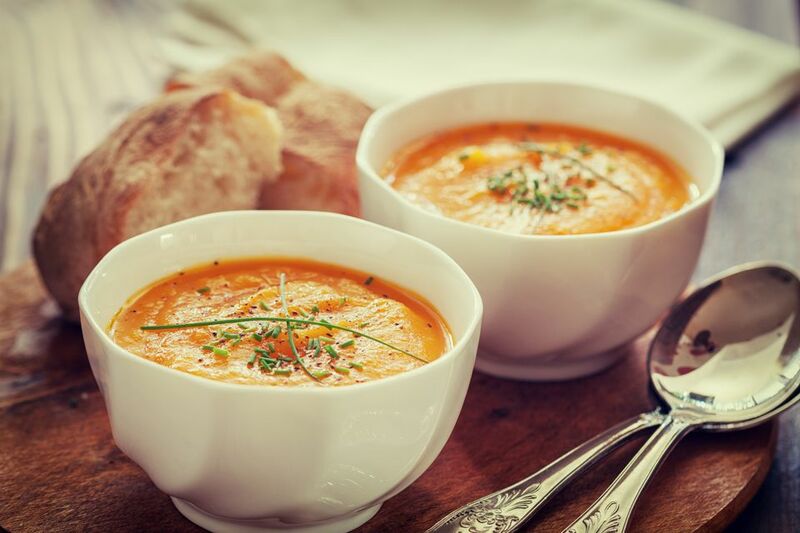 Gingery and fiery this vegan soup is perfect any time of the year and for lunch or dinner. The zesty heat is mild to medium spicy. Another bean based stew that is a favorite in our home. The hearty ingredients include beans, smoky sausage, healthy chard, and fiery habanero chilies. The heat is medium-high spicy. Spicy Corn Chowder: Ready in a Jiffy! An easy to prepare dairy-free spicy corn chowder that can be made vegan or vegetarian when pieces of crumbly cheese are used as a topping. A spicy spin on the traditional Czech beef goulash, this hearty stew will get you through the harsh cold days of winter. Dinner doesn't have to be a huge project, this uncomplicated peppery chicken and vegetable soup is loaded with good for you ingredients and it's super easy to prepare. This Austrian potato goulash soup is a great way of changing up your normal potato soup recipe. You'll love the creamy potatoes, smoky bacon and spicy tones of cayenne pepper.